News and chat about this exciting new series, with thanks to DerekD for getting the ball rolling with the thread for the original announcement, but please keep chat here limited to these new episodes and the performances (in their own right) therein once released. 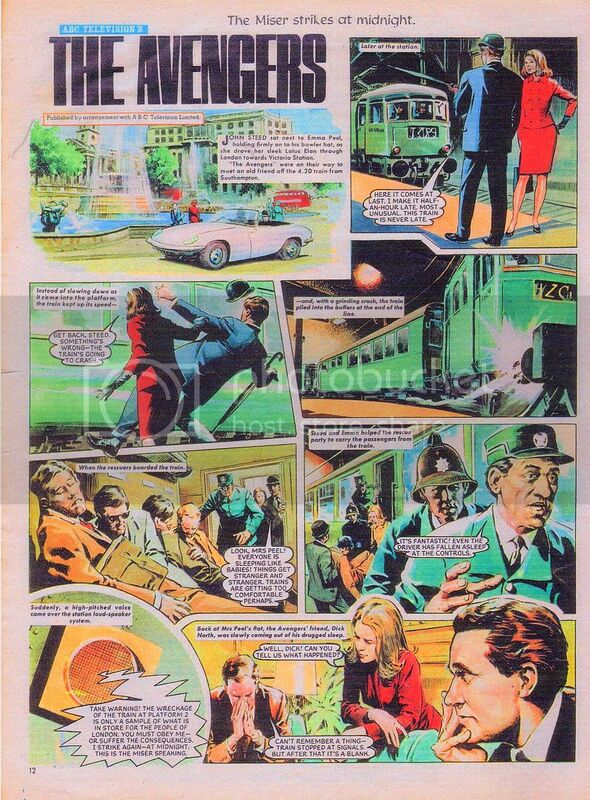 I'm looking forward to the Big Finish adaptations of the Diana Comic Strip stories. Fabulous news. 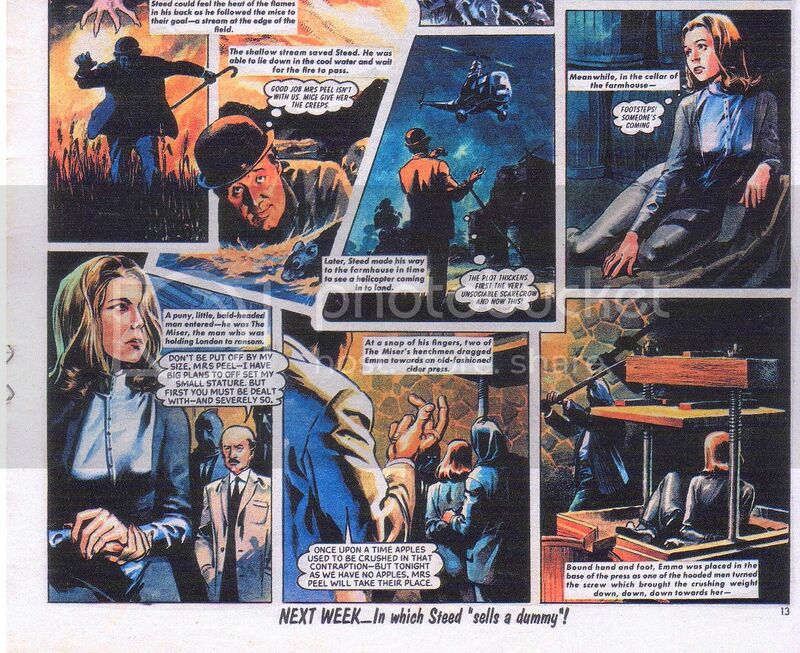 meticulously well drawn and far more detailed than the illustrations of the Steed and Mrs Peel Boom comic strips. I wonder who wrote the Diana stories and who will be cast as Emma Peel? 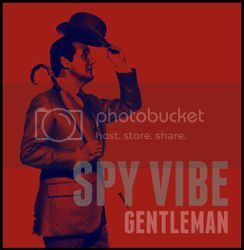 They definitely capture the spirit of the Steed/Peel era along with splendid touches, twists and feel of a Francis Durbridge mystery-thriller with Paul and Steve Temple story-lines combined with the suspense and adventure of John Buchan's 39 Steps and Peter O'Donnell's Modesty Blaise. The comparison between The Avengers and Paul Temple is an interesting one. This first story looks like a cross between Castle De'ath and Honey for the Prince. This new story-line reminds me of a Paul and Steve Temple mystery. Mrs Peel captured, bound and placed into a cider-press is very reminiscent of the Mrs Peel wine-press torture scene in A Surfeit of H2O. The Avengers strip in issues 199 to 224 of the D.C. Thomson-published Diana comic is considered by many to be the acme of the comic book appearances of the show, with many people drawing attention to the quality of the art. According to David A. Roach in a letter to Comics International in September 2000, 'the strip's principal artist was Emilio Frejo, who was helped out by his fellow Bermejo studio member Juan Gonzalez Alacrejo on about half the episodes'. Roach also waxes lyrical about the art on many of the other strips in Diana contemporary to The Avengers. The art is, indeed, wonderfully detailed, and utilises photo-reference material skilfully without drawing too much attention away from the story. The final and best story, pits Steed and Emma in mortal combat against several of their most diabolical enemies, and has something of a 'Dressed To Kill' or 'Superlative Seven' feel about it. I'm very excited for this series! That said, I really hope that Big Finish hires good writers to flesh out these stories. Because what's great about the Diana comics is not the stories; it's the artwork. The storylines themselves tend to be pretty simplistic, as they were meant for kids whereas the show was designed to appeal to adults (with kids as a bonus). They were also meant to work in two-page installments and wrap up in eight pages or so. So obviously there's a lot of room to augment them in fleshing them out into hour-long audio dramas, and I'm sure that's what Big Finish will do! 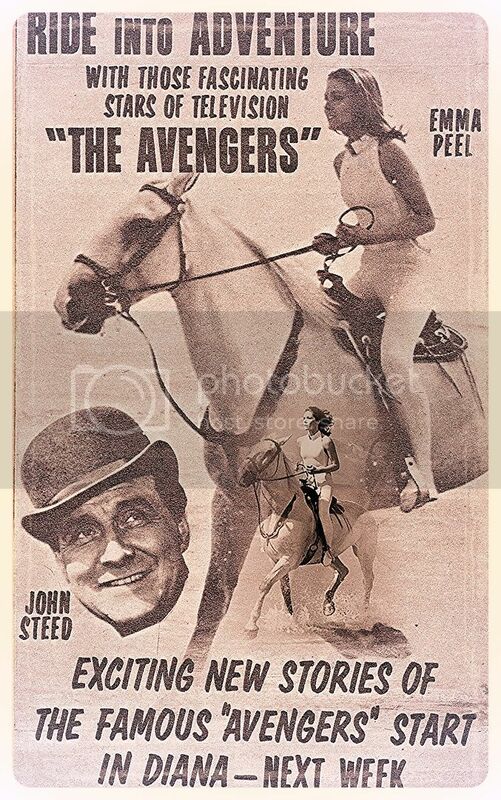 It seems to me that the obvious candidate to play Mrs. Peel opposite Wadham's Steed would be Rachel Sterling. Whether she would want to do it is another matter (though she hasn't shied away from following in her mother's footsteps before, playing her role in a stage version of Theatre of Blood), surely she'll at least be asked...? Oh, and the news that Big Finish will publish a collection of the Diana strips in book form was as welcome to me as the audio drama announcement--possibly more so! I love the art in these comics, and can't wait to have a handy book version to read and sit on my bookshelf. I wonder though--does this arrangement mean that Boom! have lost the license to print Avengers comics? Or is reprinting older material a whole separate license? It would sure be great to see ALL the original comic strips reprinted eventually. 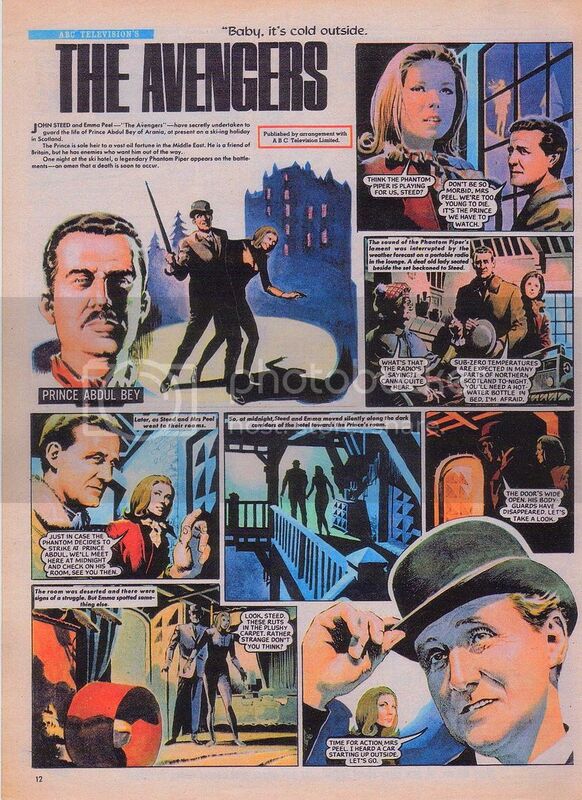 Especially "The Growing Up of Emma Peel" and the Cathy Gale material! But I wonder if the fact that they were published in so many different places makes the rights hard to sort out? @ mrs_emma_peel - thanks for sharing those, they do look very good! Looking forward to seeing them in a complete volume. @ Brisco - in the past, I have found Big Finish a bit 'hit and miss' with this sort of thing, but they are pretty good at keeping to a style once established. If they aim to make them fit the production style of the Lost Stories, that is to say less pacey and effects driven than some of their other ranges, and especially if they ask John Dorney to be involved then I think it should work. Lisa Bowerman is an actress and an audio-play director at Big Finish; she played Dr Who's companion Bernice Summerfield who was partly-based on Emma Peel, so maybe she'd be more likely than Rachael Stirling to play the part, though I would love Rachael to do it! Hi Frankymole, good to see you back online! If I remember right, Rachael Stirling was the actress we agreed would make a good Emma (for obvious reasons) when we chatted about it on Horizon; but you're right that it's more likely to be part of the BF rep company with Lisa Bowerman, Beth Chalmers or maybe Sarah Mowat who led their Dalek Empire audios in the past. it's so fun to see these scans of the comic strip- thanks for posting! i can't wait for the compilation. now i'm really interested in tracking down some original comics for my collection! So does anyone know when these comics will be ready for purchase? It's interesting that they also have the scene where everyone is asleep on the train-got straight out of TNA. Just 2016 at the moment, so far as I know. I love the radio adaptations from Big Finish, their work is truly impressive, it must have been beyond our expectations now they're about to release another Avengers history-related chapter. I can't wait and it will be quite exciting to observe the illustrations while listening to the episodes. I like the clever titles and witty tag lines for the first four audio book titles and synopses - they display good writing, research knowledge and feel for the tradition of Avengers titles. I'm enthusiastic about these adaptations. 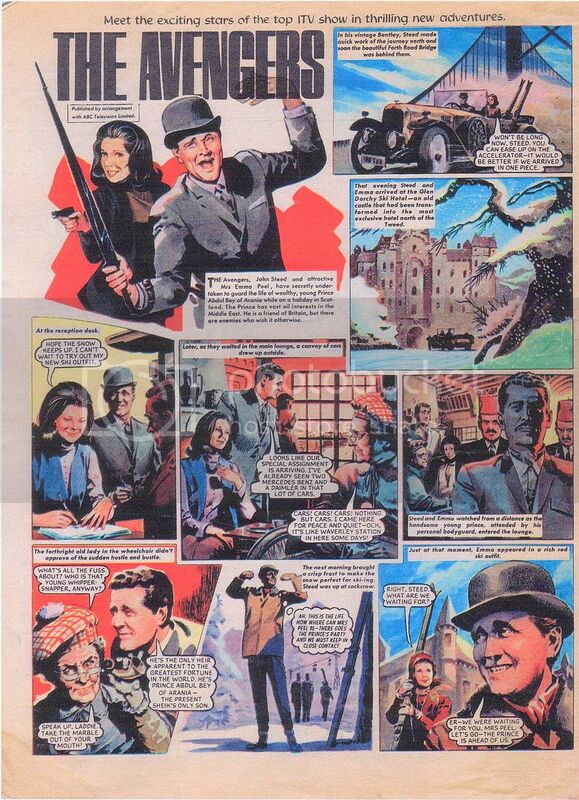 Recreations of the comic strip adventures of Steed and Mrs Peel which appeared in Diana magazine in 1966 and 1967. More details will follow. Emma hits the heights of fashion... Steed plumbs the very depths. Julian Wadham (John Steed), Olivia Poulet (Emma Peel), Sam Kordbacheh (Prince Abdul Bey), Shelia Reid (Morag McIntosh/Matron), Allan Corduner (James McTaggart/Murdoch/Crabtree), Ruby Thomas (Countess Beatrice of Burgundy),Simon Greenall (Colonel Augustus-Smyth), Jacqueline Pearce (Madame Zingara),Becky Wright (Bunty/Nurse), Christopher Naylor (Emil/Sailor), Nick Underwood(Anton/Rough Sailor/Announcer), Timothy Speyer (Oswald English/Captain Jolleye/Radio Presenter), Ewan Bailey (Ivan Stevenson/Venka/Newsreader),Francesca Hunt (Ingrid Thornton/Brunhilda), Jot Davies (Wellington). Other parts played by the cast. Also worth noting the presence of Jacqueline Pearce - who appeared in A Sense of History back in the 60s. 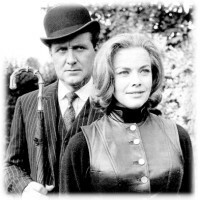 OK, I have an honest question for people that are excited for this: how do you feel about other actors taking on the personas of characters that were more or less created by Patrick Macnee and Diana Rigg? And is it legitimate to compare these performances, whatever they might turn out to be, with the originals? I'm completely fine with it. What is produced by Big Finish doesn't replace the originals, any more than the radio series, stage show or movie did. The original line-up of Macnee and Rigg is still there, preserved beautifully on DVD and Blu-ray to be enjoyed for many years to come. The CDs and downloads are additional to the series for me - essentially, in their own bubble of the canon, not affecting the main canon, but creating one of their own. I must be honest and say I don't spend too much time comparing one interpretation to another, old to new or vice-versa. I try to enjoy them on their own terms, without bringing the baggage of "Well, Patrick would have played that scene like that," or "Ian / Diana wouldn't have done that" to each listen. Of course it's legitimate to compare, but personally I don't feel the need to. I'm completely fine with it. What is produced by Big Finish doesn't replace the originals, any more than the radio series, stage show or movie did. The original line-up of Macnee and Rigg is still there, preserved beautifully on DVD and Blu-ray to be enjoyed for many years to come. Thanks! Can I ask why you're fine with it? Are these not the same characters, or they just different interpretations of the old ones? Do they have to pay any attention to the originals at all, or can they just do as they please? I do think that any adaptation of something as iconic as The Avengers has to carry some baggage with it. It's not created in a vacuum where the originals don't exist, under total ignorance of their existence - in fact, it's depending heavily on the originals as the basis (e.g. we're returning to Castle De'ath, which means we had to go to Castle De'ath once before). (I will say, personally, that I find Wadham's Steed badly acted and off-putting in and of himself. A comparison with Patrick only makes it that much worse, but is not the basis on which I dislike Big Finish). I have just explained why I am fine with it. Alan, I was mostly wondering if you (or anyone else looking forward to these) considers these to be the same characters, or something else, and if they're in any way beholden to the originals - as in, do they have any obligation to the originals in your view? No worries if you'd rather not respond.